Think back to your playground days. Remember giving up your swing, head down in defeat, to the neighborhood bully? Feeling powerless, you wanted more than anything to be stronger, faster, and more confident in yourself. Maybe you still feel that way sometimes. After a stressful day, you feel sluggish, unbalanced, and out of control. Not me. I’ve been doing karate since I was 4 years old, and over the past eight years, I’ve learned that it’s more than a sport. Karate is a lifestyle. It teaches self-defense, sure, but it also transforms your mind, building confidence, coordination, friendships, discipline, and so much more. When I started at USSD, karate gave me the chance to make friends and be myself. My classmates and I did backflips, broke boards, and created lasting bonds. For me, that’s what karate is all about. The past two years of karate have been my favorite. When I help kids who are just starting out, I feel happy — I’m helping build their brains, their muscles, and their hearts. Now that I’m a brown belt and about to become a teenager, I look back on all that karate has given me. I’m fit and healthy thanks to karate’s intense, four-day-a-week workouts. My coordination is great, and I’m definitely not afraid of playground bullies. But it’s not just karate’s hard hits that have made me stronger. In the dojo, respect is everything. My friends and I bow before and after each class, and making fun of one another is not cool. We respect our sensei, ourselves, and one another. As I’ve climbed karate’s ranks, I’ve also learned to set goals. To earn each new belt, I have to know all the current rank’s forms. That’s tough, but karate teaches you that you have to work hard to get what you want. Don’t think karate’s all work and no play, though. My friends and I have loads of fun playing games to master new moves, build trust, and learn teamwork. 1. Leadership. As a teacher’s assistant, I’ve been lucky enough to teach karate to a new crop of kids. And my sensei was right — I’ve truly grown by helping others. I’ve learned to take the lead in groups, speak in public, and be a better problem solver. 2. Friendship. Karate isn’t all about protecting yourself and using weapons; it’s also about being a friend. When I get knocked down in the studio, my friends help me up. If my frustrations boil over, classmates calm me down. It’s a great group that’s taught me to be a better friend. 3. Self-confidence. Training in the dojo helps me feel good about myself, and that’s not something all kids have. I approach math problems and karate kicks with confidence, knowing that I can accomplish anything I set my mind to. 4. Awareness. Part of martial arts is seeing the dangers of the world. During karate practice every Friday, I do something called demo. The class involves skits of kids standing up for themselves, reminding us that there are bad people out there and that self-defense is an important skill. 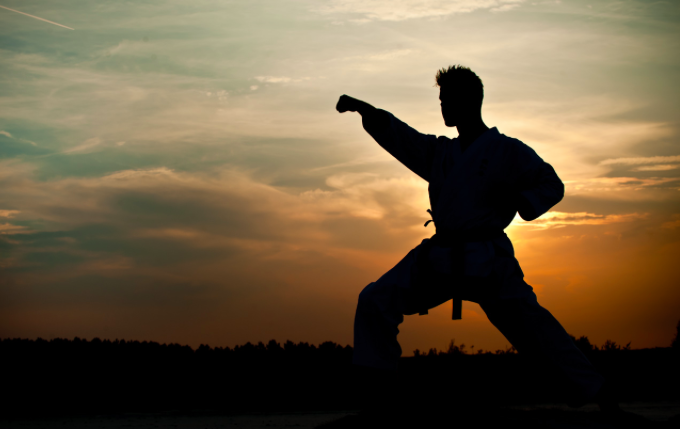 For kids and adults, karate is an incredible learning experience. So if you’ve never set foot in a studio, why not start today? After a year — or a lifetime — of karate, you’ll walk away with new skills, great friends, and a body and brain ready to tackle anything that comes your way. Kenan Pala is a guitarist, triathlete, trumpeter, traveler, poet, and martial arts enthusiast. At 12 years old, he’s juggling his education and his passions for music, entrepreneurship, and staying active; he enjoys going on business trips with his mother and exploring historic cities. Triathletes, as well as his entrepreneurial parents, inspire Kenan.